Among Katharine Hepburn's most famous and auspicious screen collaboratorsincluding, in my own order of preference, George Cukor, Cary Grant, and Spencer Tracydirector George Stevens is the least fêted member, but his achievements with Hepburn should not be undervalued. Once an established star, she never looked more radiant than she did in 1942's Woman of the Year, where Stevens' generous showcasing of her look and her performance beautifully counteracts the script's rather mean imbalance against her. (Well, maybe until that cooking scene, anyway.) Earlier than that, Stevens gamely ushered her through a spritely and underseen J.M. Barrie adaptation called Quality Street (1937), where Hepburn's comic dual-performance paves the way as none of her previous roles had done for the screwball delights of Howard Hawks' Bringing Up Baby (1938) and the aristocratic wit of Cukor's The Philadelphia Story (1940). But moving back still earlier, it's not clear that any of Hepburn's once and future heights would have been reached without the pretext of her first truly great performance in Alice Adams, which finds her amidst a glorious, once-in-a-lifetime metamorphosis from the queer, coltish ingénue of 1933 (Little Women, Morning Glory, Christopher Strong) into the rounded sophistication of her later work, somehow softer and more confident all at the same time. Alice Adams is the moment where Hepburn becomes a star, and also the moment where she becomes truly lovable. Adapted from a novel by Booth Tarkingtonthe writer, too, of The Magnificent AmbersonsAlice Adams tells the story of a lower-middle-class girl, not far past her schooling years, who positively quivers with longing to join the coterie of her more fashionable peers and to find the kind of domestic bliss that presumably once united her parents (the excellent Fred Stone and Ann Shoemaker), whose tacit bond of affection is now sorely tested by illness, monetary need, and other trials of late middle-age. Alice Adams is the kind of girl who would adore Pride and Prejudice, even though in real life she might well have settled for Mr. Collins. One of the major ambitions of the screenplay and, I'm guessing, the novel is to keep Alice so dotingly loyal to her family even as she dreams of something bigger or other than what they have, which often compels a shame of her circumstances and a coy dishonesty about who she is and who they are. That the emblematically patrician Hepburn is so convincing within both this cast and this caste is a complete revelation, even more so in hindsight than it must have been in 1935, but her empathetic connection to this girl's gossamer aspirations couldn't be clearer. Her body and voice are much more relaxed than we're used to seeing and hearing them, and even though she takes center stage in a way she wouldn't truly do again until David Lean's Summertime in 1955, she holds the movie, as she does the character, with graceful, unpugnacious care, as though cupping her hand around the spores of a dandelion, keeping them from blowing away. Stevens, so intuitive and judicious in realizing his best films, cuts to Hepburn at unexpected moments, lingering on her face longer than other directors wouldpossibly because, as in Woman of the Year, he's found the right angles and lighting concepts to make Hepburn's proudly intellectual face stay remarkably open and emotive. But more than that, his gift falls in knowing when to cut to Alice, when to understand the debates and dramatic actions surrounding her as essentially her story, rather than that of the bumptious family unit or the town at large. 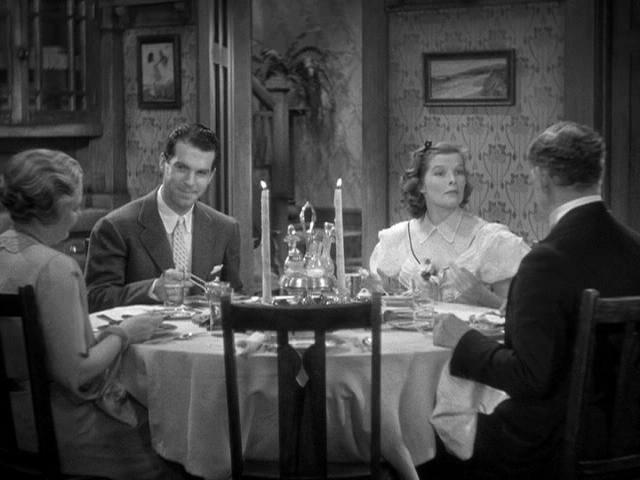 The two centerpiece sequences of the movie, when the guileless and ill-dressed but optimistic Alice takes her Cagneyish brother Walter to a local-society ball, and later when suitor Fred MacMurray arrives chez Adams for an uncomfortably hot and subtly humiliating evening of dinner and conversation, rank among the greatest passages of narrative filmmaking in the American cinema of that decade. The style is elegant and holistic, even as it magically embraces such different elementsMacMurray's somewhat lumpen appeal, the adroit conveyance of stifling temperature, the wholly unexpected elegance of Walter's dancing, a tart cameo from Hattie McDaniel, a romantic proclivity for fades and dissolves on Alice when her spirits flag, and the almost neo-realist shot where she kicks her wilting, homemade bouquet of hand-picked violets under a chair. There is also, of course, the justly famous and encapsulating shot of Hepburn weeping in her bedroom after the ball, filmed through the rivulets of rain running down her window. Moment by moment by moment, Alice Adams reverberates with humble but sure-handed technique and a credible reverence for modesty as a virtue. The last line of the movie is "Gee whiz! ", and as dramatically precipitous as it isthe one major miscalculation in the script, I thinkthe sentiment is fully shared by the audience.